Water Softeners are not a one-size-fits-all appliance. Easton’s Water tests your water for hardness, iron, and other concerns you may have. Then we visit with you about your water usage patterns and look over your plumbing and the types of water using appliances in your home or business. Then we help you select the unit that is exactly right for you and your budget. Want a HIGH VOLUME WATER CONDITIONER for your business? Easton’s has the products for you! The specially engineered Eco Max, providing years of extremely efficient, reliable operation. This unit uses “upflow brining” technology to greatly reduce water and salt usage. Inside the Eco Max is a special softening resin that has a denser “10% crosslink” structure. These dense beads stand up better to both iron and chlorine making them last 30% longer than resins in standard machines. The Eco Max features Hellenbrand’s special distributor plate. These plates enhance how water flows through the system for improved softening capacity and water pressure. They do a better job of cleaning the system by literally “scrubbing” the inside of the softener. Since there are times when a water softener alone cannot solve all your problems, Hellenbrand offers this DMT unit. “Dual Media Technology” combines a water softener and a water filter in one unit! The City Water version of the DMT treats both hard water AND chlorine. 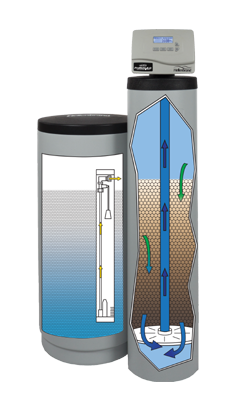 This design combines the high efficiency water softener technology of the ProMate 6.5 with carbon filtration for chlorine removal. The Well Water version of the DMT softens water AND filters out problem iron, manganese, and tannins. Well water that was yellowish or brownish comes out clean and clear! The E6 has several engineering advantages over single tank systems and over competitor’s twin tank softeners. This is the only water softener on the market that has ZERO moving parts that come in contact with hard water. Soft water keeps all components much cleaner. That means less wear and tear and therefore fewer repairs. The dual tank design assure soft water round the clock. Having twin tanks also cuts out the wasted “reserve capacity” required in single tank units. The E3 is a great water softener for the economy-minded. But, there are no corners cut here! Like all Hellenbrand units the E3 is engineered, manufactured, and assembled in Wisconsin. The E3’s metered controller calls for regenerations based on your water usage not every-so-many-days as time clock softeners do. The E3 features a highly reliable valve design that reduces repair costs over the lifetime of your unit. Iron Filters for well water are your #1 choice for rust and odor problems. 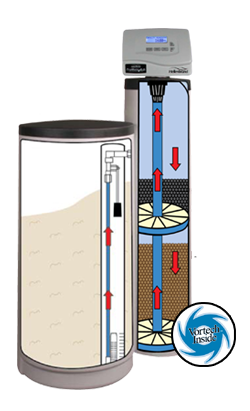 These special well water filters can be designed to treat any amount of iron, manganese, and hydrogen sulfide. We can even customize our Iron Filters for Iron Bacteria and Sulfur Bacteria. Easton’s Water has partnered with Hellenbrand of Waunakee, WI. We are an exclusive distributor of their patented Iron Curtain product line. These are hands down, these best Iron Filters on the market. And they’re backed by the best engineering in the industry! 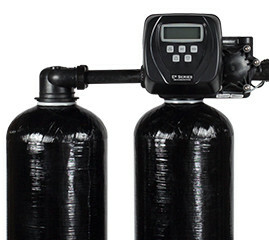 Combining Iron Filtration with a good Water Softener will greatly improve the water quality for your home or business. Then the compact, yet powerful Iron Curtain Storm is the unit for you! Every time you open a water tap, water will flow through a compressed pocket of ozonated air. Ozone is nature’s most powerful disinfectant. There is no taste, smell, or chemical by-products. The ozone also reduces iron buildup in the parts of the Storm helping the unit operating more reliably for longer periods before needing cleanup servicing. No iron level is too high nor water demand too great for the Iron Curtain system! Nasty sulfur odors, manganese, iron stains, and iron bacteria all are eliminated by this two-stage system. The Iron Curtain controller measures every gallon you use. When you’ve reached capacity, the system automatically pumps a fresh “head of air” into the 1st tank. Water sprays through this air and creates millions of micro-bubbles. These bubbles naturally oxidize iron and sulfur into clumps and cause it to fall out of the water. After Iron is oxidized into clumps it can be removed in the 2nd tank. This tank uses the patented Hellenbrand multimedia depth filter design. Iron gets strained out of the water as it travels down through the filter media. The filter design gets gradually finer and denser. This allows the system to remove a wider range of Iron particulate than other systems. 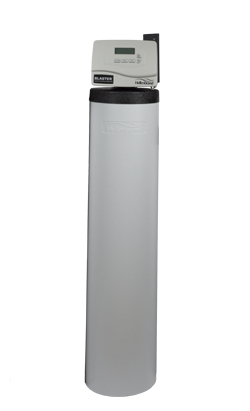 When a water softener alone cannot take care of your iron, the Iron Curtain Junior is a cost effective choice for handling many odor problems and up to 3 ppm of iron. 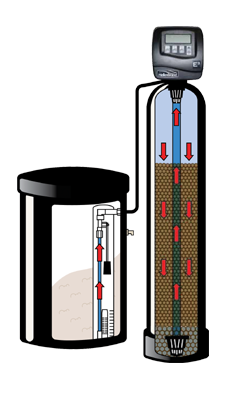 This system uses natural aeration and a special media with catalytic activity to speed up oxidation. The iron precipitates and is filtered out of the water. Every three nights the Iron Curtain Junior flushes out these iron particles, thus preparing itself to once again filter incoming iron. The right Water Filtration System can take regular tap water and turn into the exact quality you want. Home Drinking Water Systems can give you safer, better tasting and smelling water. You’ll enjoy unlimited high-quality water for drinking, cooking, and ice. Pets love it too! Need ULTRA PURE WATER for your business? Commercial DI or RO units provide top quality water for specialized processes. Or do you need to remove NITRATES, CHLORINE, or BACTERIA? 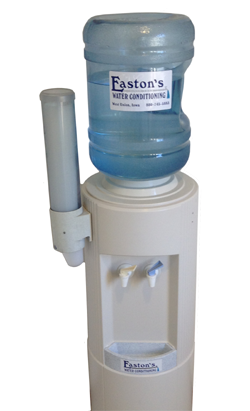 Easton’s Water can provide the right solution for you. Give us a call or send us an email to find the best Water Filtration System for your needs! Have NITRATE or CONTAMINANTS? Reverse Osmosis gives you bottled water quality from your own drinking water tap. 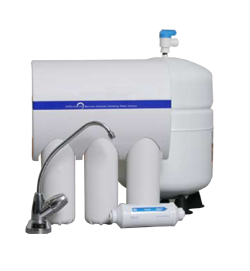 Reverse Osmosis units are the treatment of choice for reducing nitrates from well water. Consumers wanting to purify the water from their municipal supplies also love the fresh tasting water from their RO systems. With up to 98% of impurities removed, RO water brings out the flavor in coffee and juices and cooked foods. In addition to having an RO faucet at the kitchen sink, many households run an RO line to their icemaker to enjoy the clear ice cubes RO water makes. When considering a Reverse Osmosis unit, keep in mind this is not a whole house system. The purified water the RO produces goes into a small storage container that is a miniature pressure tank. As soon as water is used, more water is produced. *Reverse Osmosis is effective at removing Arsenic V only. Arsenic III requires specialty filtration. Don’t like that CHLORINE TASTE? 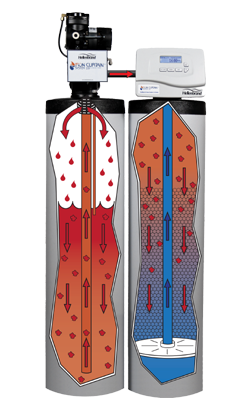 Carbon Filters are an economical way to improve the taste of your water and ice. Carbon filters are a simple, cost effective means of providing better tasting drinking water. They remove chlorine and organic chemicals yet leave in minerals. Eastons Water can help you select the size and type of carbon filter for your application and the desired purity level.. Most customers have a separate faucet for their filtered water. Easton’s Water can schedule periodic filter replacements for you. The Hellenbrand HRO4-Series Membrane Systems are state-of-the-art, versatile systems for treating municipal and brackish water supplies and with flow rates ranging from 500 to 8,000 gallons per day. Minimal energy consumption, low maintenance and operation costs make the HRO 4-Series reverse osmosis systems the right choice. 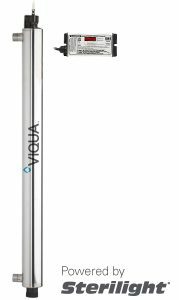 Big on features but not on space, HRO 4-Series Systems feature a robust, innovative design that allows for versatility in the event of feed water quality and temperature variations. Hospital Surgical Centers, Hospital Air Humidification, Spot Free Rinsing in Car Washes, Chemical Plating Process Water, Coolant Blend for CNC Machining, Whole House Reverse Osmosis to reduce high dissolved solids spotting issue and organic contaminant water quality issues. Have BACTERIA in your water? An Ultraviolet Light kills bacteria, providing worry-free water throughout your home. When a water test shows that you have bacteria in your water you need reliable equipment to keep your family and guests from developing intestinal or other health problems. 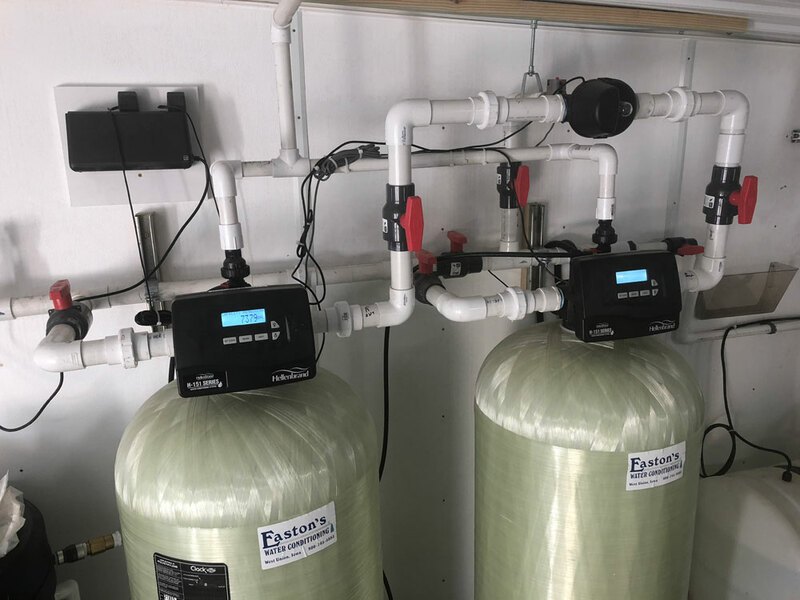 If your water is clear, ultraviolet lights are a reliable, low maintenance product to kill that bacteria without chlorination or other chemical treatment. Easton’s Water will remind you annually that it is time to service the UV lamp system to assure continued destruction of the bacteria in the water for your entire household use. Want COLD, GREAT TASTING water? Bottled Water Coolers dispense purified, tasty water at the temperature you like. Few things satisfy like a drink of cold, fresh tasting water. Water coolers provide our high quality water at a convenient location in your home or office. Easton’s Water both rents and sells water coolers manufactured by Oasis. We set our customers up on a regular delivery schedule to assure a continued supply of high quality drinking water. Our five gallon jugs are more economical and eco-friendly than buying water in those small plastic bottles. Certified Water Specialist, Member Water Quality Association, Master Plumber Iowa Department of Public Health.